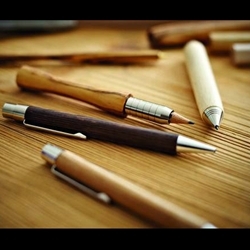 A special theme of interest is the manufacturing of eco-friendly promotional items: wood pens, fsc-certified wood products, corporate business gifts, promotional gifts, green gifts, made in Germany. Ask us - we are glad to advise You! All of our products are made on classic turning leathes according to craft tradition. We prefer to work with domestic woods such as copper beech, sycamore, maple, pearwood or cherry. The tactile, pleasing finish of our wood products is created using natural oils and waxes. This makes us and our wood products feel good for a long time! Be inspired and take a piece of nature into your hands! Enjoy!